oh what an afternoon ! seven knitters from my sister knits went down to fancy tiger in denver and spent the afternoon with stephan west. Stephan was just delightful, fun, interesting and his designs to die for. 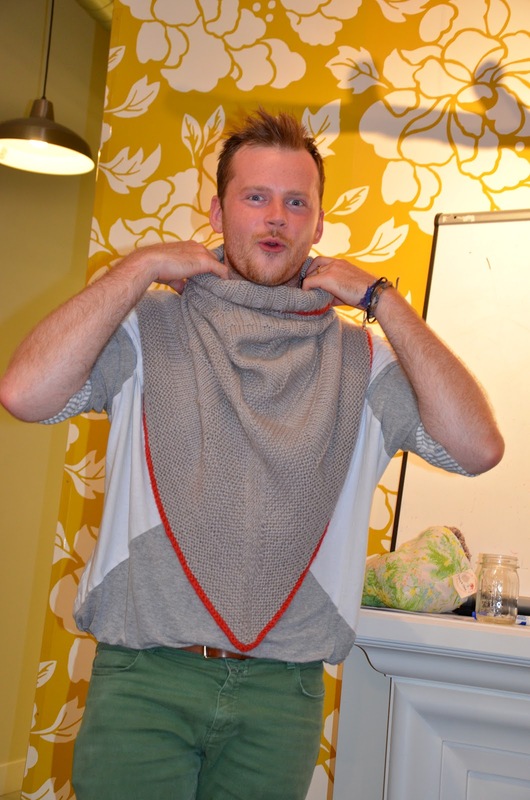 we spent several hours knitting and thinking like stephan. thanks julie for getting us all tickets. now i'm off to lancaster, pa to visit some very special people ! be back in awhile to tell of more adventures. i wore them all the time, white ones-sometimes with a little ruffle around the tops but always with my shiny [ Vaseline shiny ] black patent leather shoes ! I can still see me on the corner of Saint Paul of the Cross church waiting for all of us [ that would be 10 children, Mom and Dad ] to get done with all the Sunday morning greetings, pile into the station wagon and head to Thompson store to get the fixing for a famous Dad sunday breakfast extravaganza. we were all dressed to the nines, boys in their slacks and dress shirts with the clip on ties and the girls in their skirts, peter pan collar blouses and bobby socks. i have a smile on my face picturing all this again in my mind. my mom wore the same high heels my entire childhood. well these trees are called bobby sock trees. you can find them in yellowstone and i just loved taking pictures the bobby sock trees. i am in love with this series from netflix, it is on instant play. and jane marple is a knitter! i hope to find time this weekend to fix my header picture. just one small pic of a flower sure is boring. have been really enjoying my knitting project! even after having to frog it because i miss understood the pattern. got it now though ! loved, loved the "children's blizzard"! a true story of the blizzard of 1882 that swept through the entire heart land of the country. another book i just finished was "nothing to tell". stories of women homesteaders in montana. my favorite reads are stories about real people in real life. and i especially enjoy reading about women and their daily life's. and both of these books. fall is in the air and i'm kicking up my heels ! oh it is friday, one of my husbands favorite day ! mine too, i get to see him, have him all to myself for 2 days...yiippee. i have finished up some "hand work" that has been nagging me to block. these are baby receiving blankets that 45 x 45 inches wide, hemmed stitched then a beautiful crochet edge put around the entire blanket. i like to give a blanket and burp rag with each blanket. baby items. will have to come up with a better name. anyways, i love doing them, they are fairly mindless once the pattern is imbedded in the ole brain. i also blocked this shawl. i have made 2 of these this past summer. 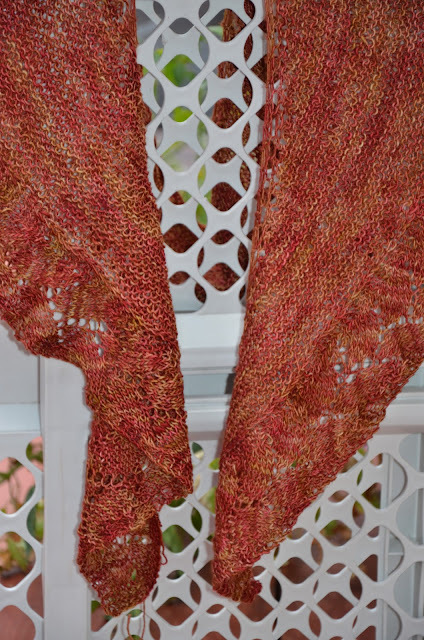 edging is a wonder lacy leaf pattern. think i will be making another in a plum color. well it has finally cooled off here in northern colorado. 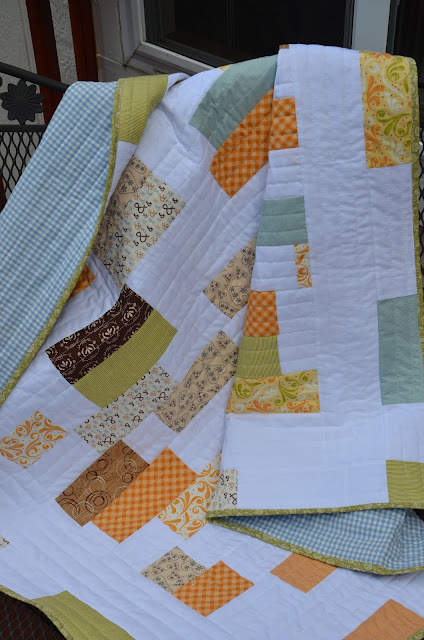 will be working on finishing a quilt that has to travel to Pennsylvania with me at the end of the month. i would love to read all about them. i may even go get a pumpkin latte this afternoon.....heehee. i can hardly believe it, i have finished, cleaned and now blocked another project. i love mindless knitting but i must admit i'm a poor finisher. weaving in all those ends. before i get to the dreaded weaving in of ends ! so there, now you have it - i have confessed ! this was given as a gift to a women i work with at the hospital. i think she will really get some good use out of this blanket. anyone do anything fun over the long weekend ? my best of friend in my whole life is giving her daughter a baby shower. i can hardly believe this little girl...... i was there her first day of her life. and now she is going to be a mommy ! how did that happen ?? i mean how did this little girl grow up so fast ? you know all these kinds of how did that happen ? i had to do SPECIAL things for her new little boy that is only weeks away from his debut. so i made a sweet water baby quilt ! and the colors are so soothing. yes i think this will do nicely ! i'm even blocking this sweater. had to throw in one more quilt shot...hehe. is this alligator not CUTE ? 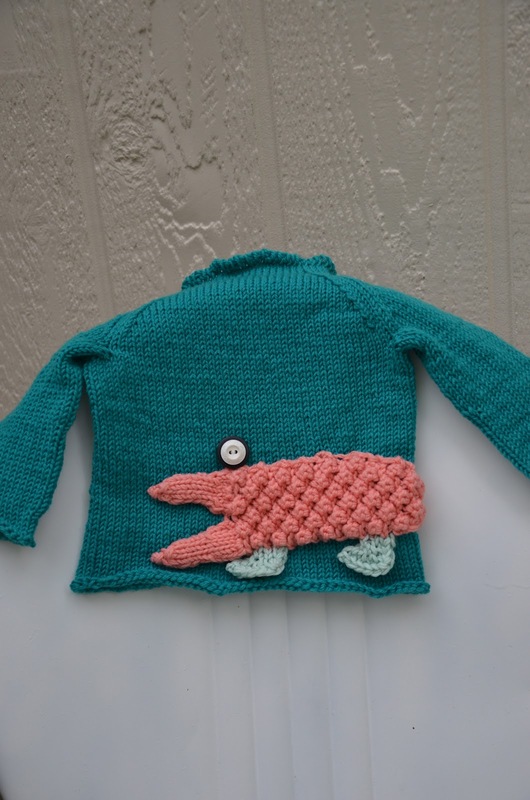 i hope this alligator is named by the person it will be worn by. and this is a the tail.